For round #2 of Pattern Review’s Surprise Sewing Bee we were to make an adult garment using up to 5 men’s button down shirts. I chose to make Katherine Tilton’s Butterick 5891, the vest option, but with sleeves. These are the shirts I used. The rayon/linen blend on the right made up the majority of the garment, with pieces of the other two used as facings and embellishment. We were allowed a small amount of other fabric for embellishment also, so I used a hand dyed wool gauze to make reverse applique circles, and red silk dupioni for bias trims and a small pleated portion on the hip area. It was a blast using the mens shirts! I didn’t win this round, but the competition was fierce and I was quite pleased to be chosen to move ahead with 24 others. You can see my contest entry here. I won, I won, I won, I won!!!!!!! Yes! 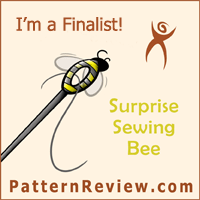 My A-line skirt won the first round of the Pattern Review Surprise Sewing Bee!!!!! There were 140 awesome entries and I am quite humbled. But I’m also quite thrilled as the prize was a box full of gift wrapped books from Roost Books, including Love at First Stitch written by this round’s guest judge Tilly Walnes. The books I received are all sewing related and are just lovely! Roost also included a big tote bag with their cute birdie logo on it. Love, love, love! Thank you Pattern Review and Roost Books!